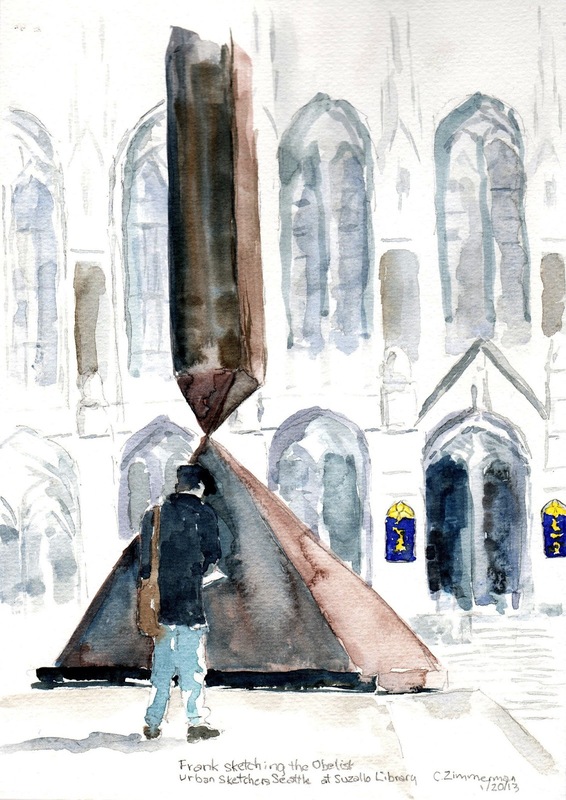 With a half hour to spare in Red Square before the sketch crawl and sunshine at last, I spotted an urban sketcher in front of the Broken Obelisk. I sketched Frank quickly knowing he was sketching on the move. I sat on my ensolite pad in the cold to finish the architectural "hints" of Suzzallo (my challenge). I chose this composition because of the unique field marks for location as well as urban sketching in the raw. The biggest challenge, besides the cold, was choosing accurate shades of watercolor with my photo gray lenses in the extremely bright sunshine! Carleen, excellent capture of both Frank and the sculpture!